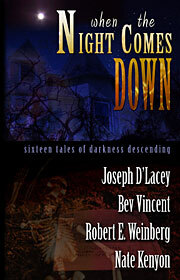 WHEN THE NIGHT COMES DOWN grabs a Black Quill Nomination! What an honor to see that When The Night Comes Down was nominated for a Black Quill Award! As you can see if you click on the link to the Black Quill Awards, Dark Arts Books’ sixth anthology When the Night Comes Down is in some fairly prestigious company. Be sure to go over to Dark Scribe Magazine, and check out their site, which is pretty awesome. Part of the coolness of the Black Quill Awards is that it’s a reader’s choice award once the nominations have been announced — anyone can vote for their favorite entries. So, when you’re checking out the nominees, be sure and vote for the ones you’d like to see win. We’re very proud here at Dark Arts Books of all the authors in When The Night Comes Down – Joe, Bev, Bob and Nate – for writing such amazing stories to get this nomination. So congrats to them all, and the rest of the nominees in all the categories.